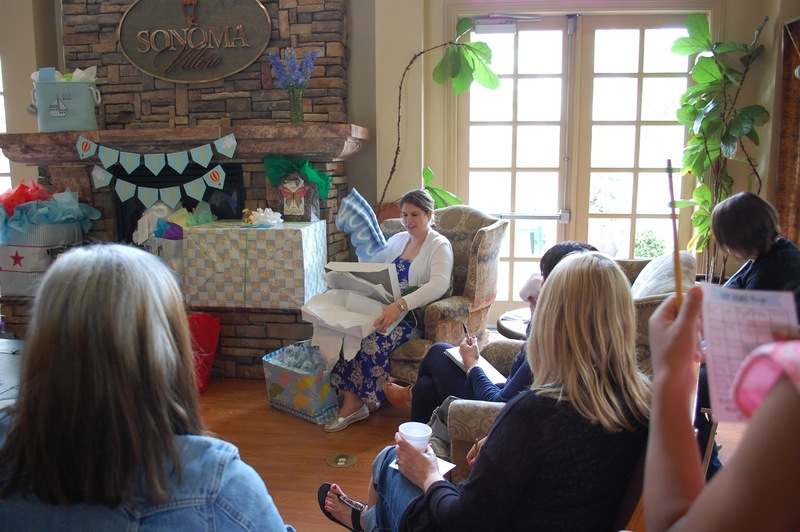 Are you looking for a little inspiration for your baby shower? 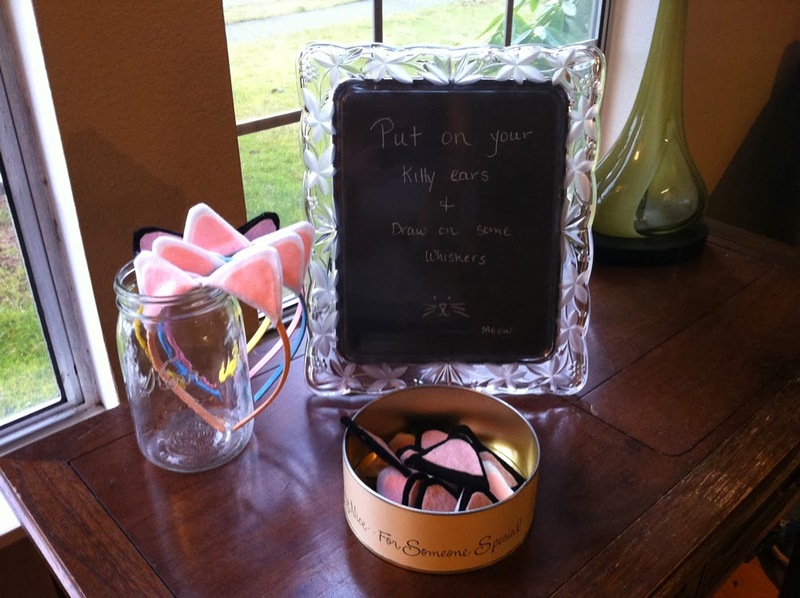 Here is a fun idea for a mom-to-be who loves to travel. 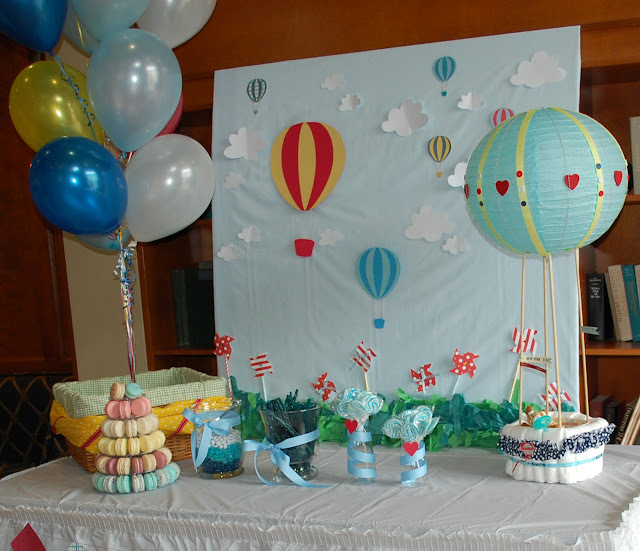 A travel themed baby shower, complete with hot air balloons, hang gliders, and sweet pinwheels. The centerpiece of the party was the desert table, complete with Macaroon tower, jars of candies, licorice, and pinwheel suckers. 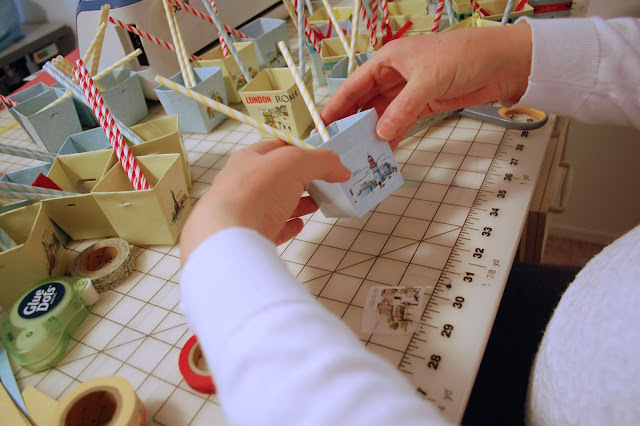 The backdrop was handmade using foam board covered with light blue fabric. The hot air balloons, clouds, pinwheels, kite banner, and letters were all cut using a Brother Scan n Cut. The diaper cake was made by attaching rolled up diapers around a box, made to look like a hot air balloon basket. 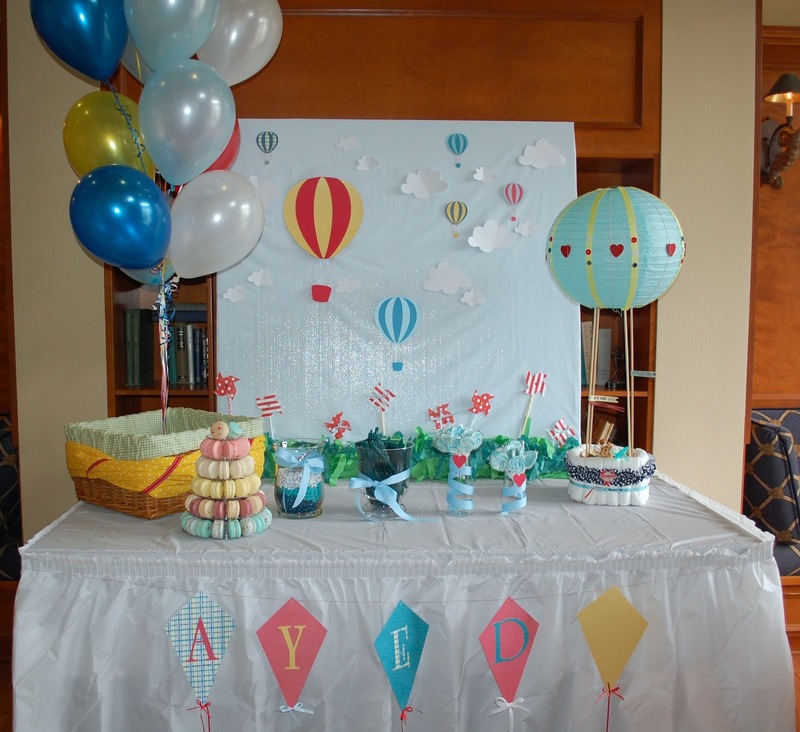 The balloon was made with a baby blue paper lantern, decorated with washi tape, heart stickers, and buttons. It was held up using 4 long woodden dowels and attached with hot glue. The party favors were made using dollar store favor boxes, decorated with travel themed washi tape. 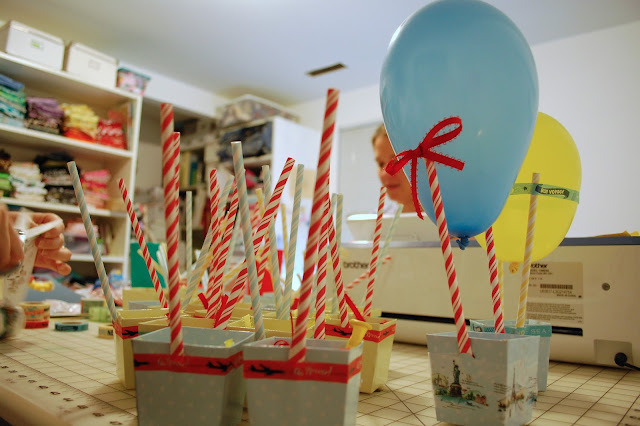 Paper straws made up the hot air balloon frame, attached to colorful mini balloons. The gift inside was handmade soaps. No baby shower is complete without a onesie bunting. I made a few onesies to match the theme, a bicycle, hot air balloon, hang glider, and kite. 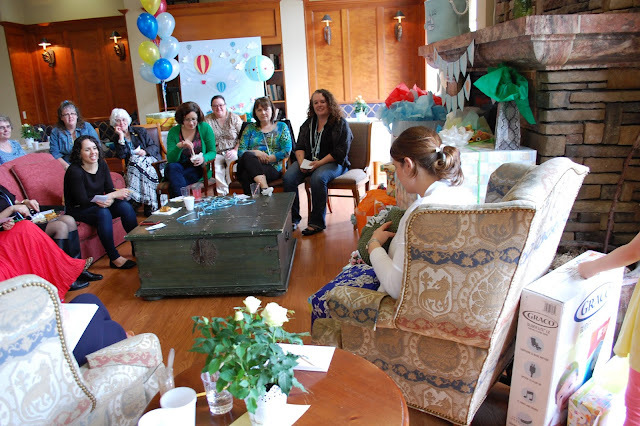 I hope you found a little inspiration here for your baby shower. Enjoy planning this special day! 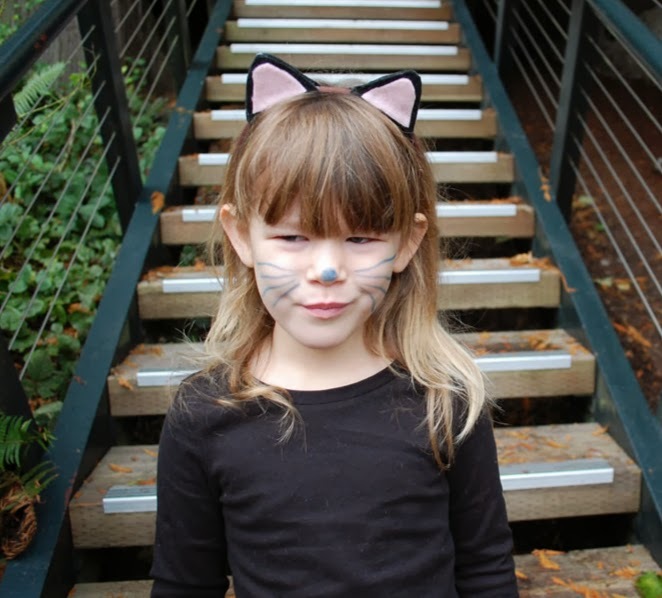 My daughter was a cat for Halloween, and loves to dress-up with her kitty ears. 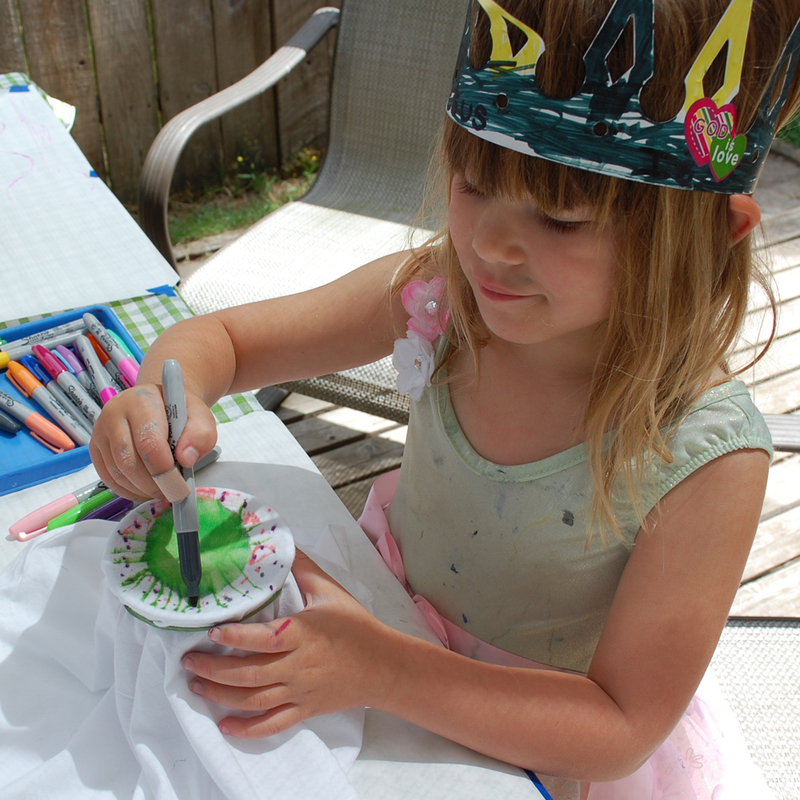 Here's how I made the adorable kitty ears in the photo above. So simple to make - surprise your little one with ears for her dress-up bin or kitty birthday party. Step 1: Make a paper template like the one shown below. Draw a diamond shape with a rounded top, mine is about 4 inches tall, and 2 1/2 inches wide. And a triangle about 2 inches wide x 1 3/4 inches tall. 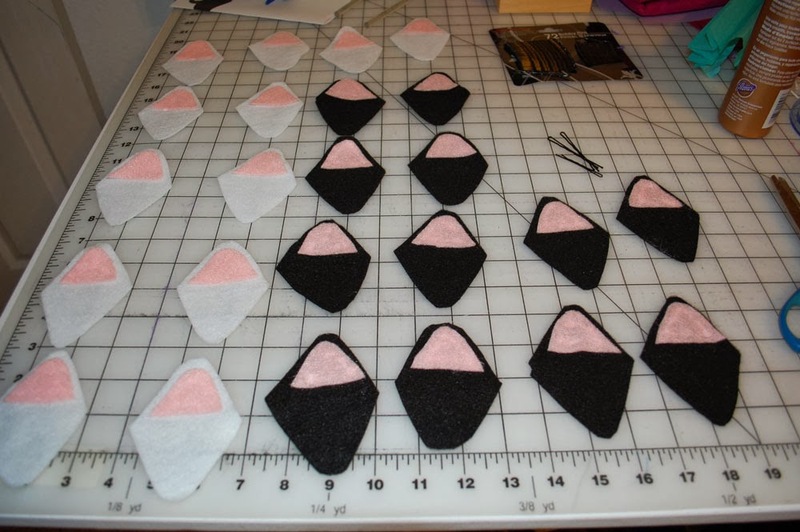 Step 2: Cut as many felt ears as you'd like. 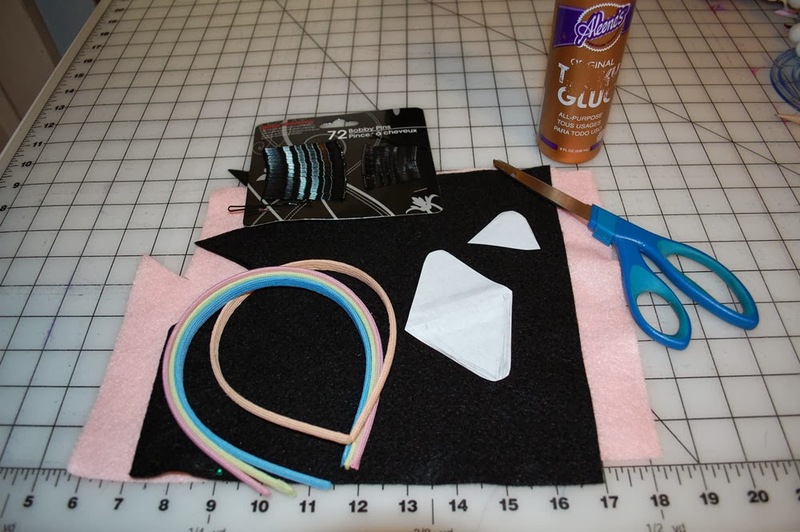 Glue on the pink felt center. 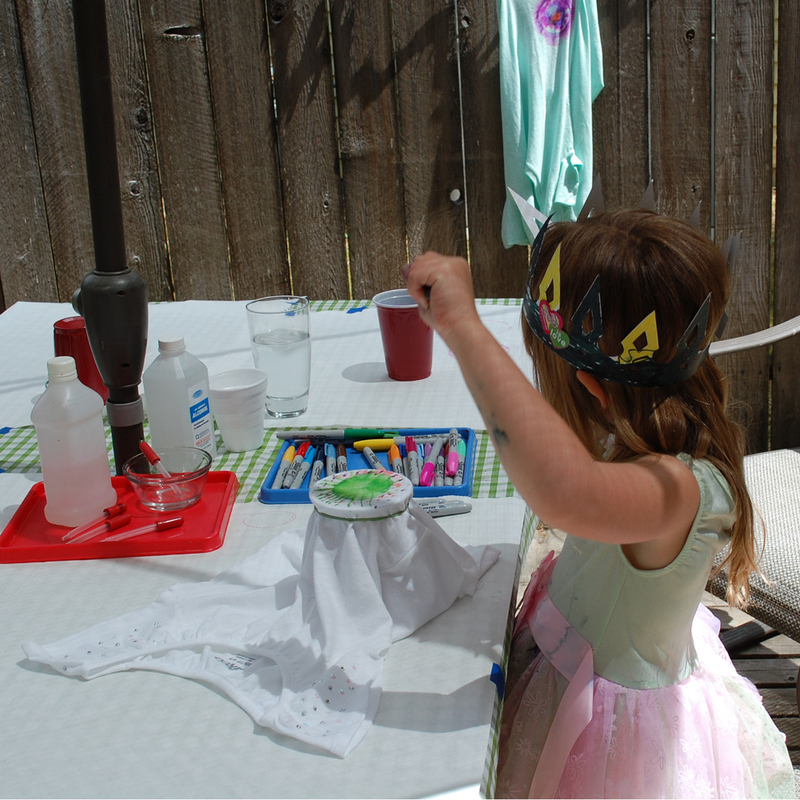 Step 3: Hot glue onto a headband. If using craft glue, use bobby pins to hold them in place while they dry. 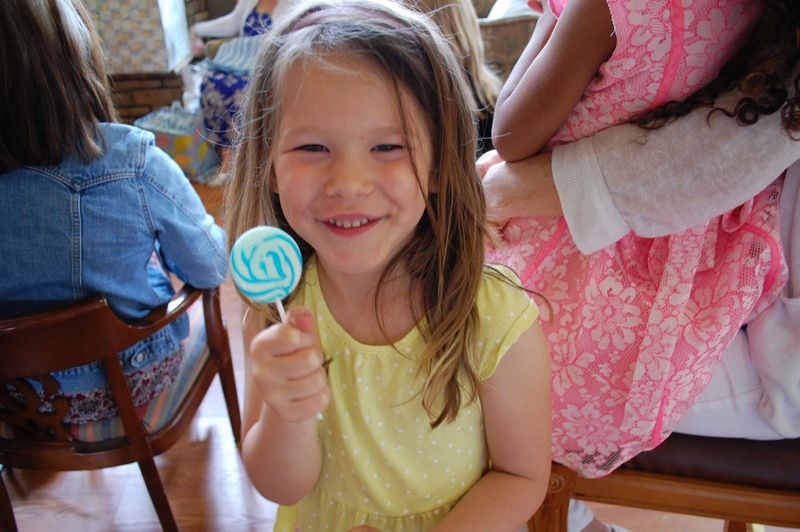 Easy, and kids love them! This was by far my favorite art project this summer. 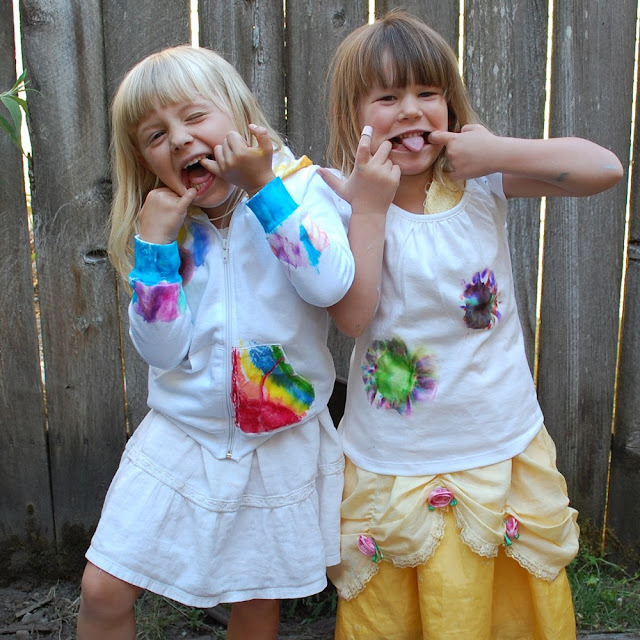 We spent an entire afternoon tie dyeing... playing... and tie dyeing some more. This project was a big hit with the kids. Place a cup under area to be tie dyed and secure with a rubber band. A plastic tray underneath worked for larger areas too. Just something so the markers don't bleed through. Draw design. Anything works, lets the kids experiment. Designs closer together bleed together better, but don't get hung up on those details. Just let the kids have fun with the markers. Once the drawing is complete, add a few drops of rubbing alcohol to the center of the design and watch the colors spread. We had to use quite a bit of rubbing alcohol with the larger designs, just keep the dropper and rubbing alcohol handy and dribble as you like. Just don't get the fabric too wet, or it takes a long time to dry. Allow alcohol to evaporate, fabric should be dry to the touch. Remove the rubber band, and move your cup, or try a different size cup to a new area of the shirt. 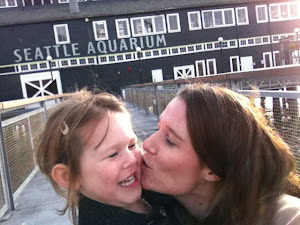 I'm Jennifer Waite and I'm glad you're here. 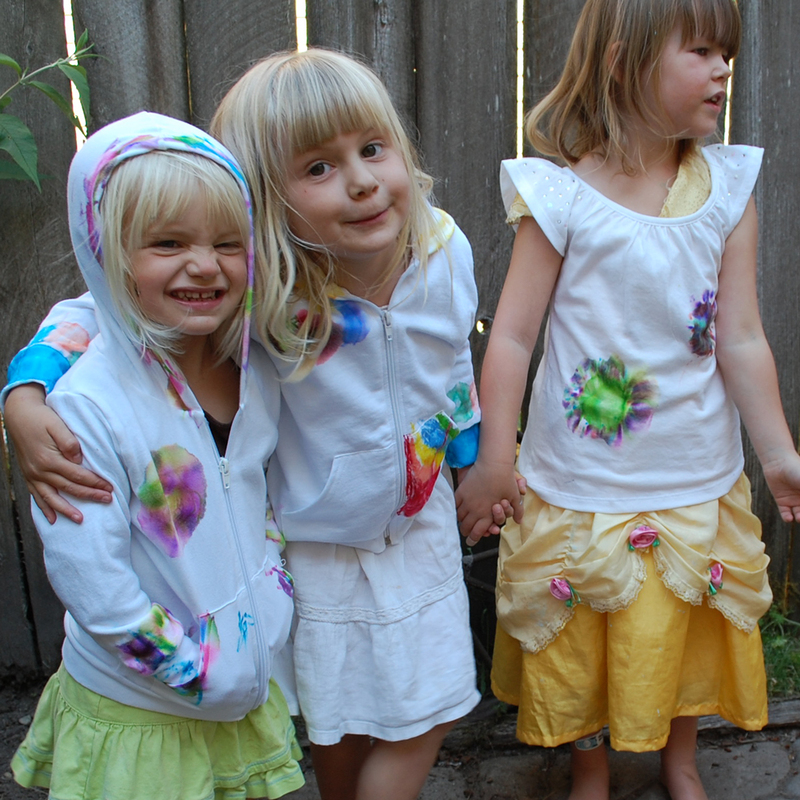 Tangled Threads by Jen is a blog about designing and sewing children's clothing and running a creative business. From Paper Bag to Basket: Upcycle your grocery bags! © 2013 Tangled Threads by Jen. Powered by Blogger.